When you have a dog, you have an automatic best friend but you also have to remember that your dog is your responsibility. In addition to providing him with a high-quality diet, you also need to take steps to keep him healthy and that means regular exercise. Dogs love going for walks. Not only is a walk a great way for your dog to stretch his legs and work off some excess energy, but it provides mental stimulation as well. A bored dog is a destructive dog, so making sure your dog’s exercise needs are met will help prevent him from developing problem behaviors (like chewing on your shoes). As important as it is to take your dog for a walk, sometimes it simply isn’t in the cards. For days when you can’t walk your dog outside, a dog treadmill might be a good option. Keep reading to learn more about the importance of exercising your dog and how a dog treadmill can help. You’ll also see our reviews of the top 10 best dog treadmills. If your dog is very large or overweight, a regular dog treadmill might not do the job. This GoPet Treadmill for Giant Dogs is a great option because it is specifically designed for giant breeds and built for maximum durability. This treadmill features a long running space which allows your dog to exhibit his natural gait and the speed is adjustable according to his ability. This treadmill features metal gates on the side for safety and so you can clip your dog’s leash to the side. The speed and other options can be altered using the onboard buttons or the wireless remote. Whether you’re looking for a safe exercise solution for overweight dogs or an indoor option for bad weather, the GoPet Treadmill for Large Dogs (Up to 175lbs.) is the perfect solution. This treadmill is uniquely designed for large breeds up to 175 pounds and it is sturdily built for durability and safety. 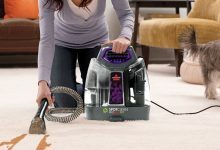 It features an adjustable speed option so your dog can walk comfortably or run, according to his ability. The treadmill has metal safety bars on the side so your dog can’t fall off and it can be controlled through the onboard buttons or a wireless remote. Specifically designed for small to medium breeds, this GoPet Treadmill for Small/Medium Dogs is a great option for dogs who need indoor exercise. The treadmill features an adjustable speed option that you can control using the buttons on the unit or through the wireless remote control. When you start the treadmill, it starts slow and builds speed slowly for safety and to give your dog a chance to warm up. With a 1 horsepower motor, it offers plenty of speed and strength but it is not overly loud and it features dolly wheels for easy movement and storage. It also contains a safety lock system. If you have a small dog, you don’t need a giant treadmill – the GoPet PetRun Pr700 for Dogs Up to 44 Pounds is a great option. This treadmill is perfectly sized for toy, small, and even medium breeds weighing up to 44 pounds. It is set low to the ground which is ideal for smaller dogs, making it easy for your dog to climb on and off without having to jump. The treadmill runs silently which is perfect for skittish breeds and it has a wireless remote control and safety lock system. Plus, it ships fully assembled which saves you the hassle. If you’re looking for a dog treadmill uniquely designed for larger dogs, the GoPet Treadwheel for Large Dogs is the way to go. This treadmill may look strange as a giant wheel, but it allows your dog to move naturally and it adjusts to his speed. You don’t have to worry about safety issues with a moving belt, and the surface is cushioned for your dog’s sensitive pads for maximum comfort. It does take some dogs more time than others to get used to the wheel and how to use it, but many dogs adjust well and enjoy using the treadwheel. It may not have a computer, but it also doesn’t have any speed restrictions. Though it may look a little strange at first, the GoPet Treadwheel for Toy/Small Breeds is the perfect indoor/outdoor exercise solution for toy and small breeds. This exercise wheel allows your dog to move naturally and it adjusts to his speed so he can stay comfortable and safe. This treadwheel is specially sized for smaller dogs and it features a wire door to keep your dog safely enclosed during his workout. The wheel itself has a cushioned surface for comfort that protects your dog’s pads. It also provides a good gripping surface for safety. For medium, large, and giant breeds the PetZen DogTread for Large Dogs Up to 150 Pounds is the perfect dog treadmill. Though it has a sleek, space-saving and low-profile design, the treadmill features a 75”x17” running surface which is plenty of room for most dogs. 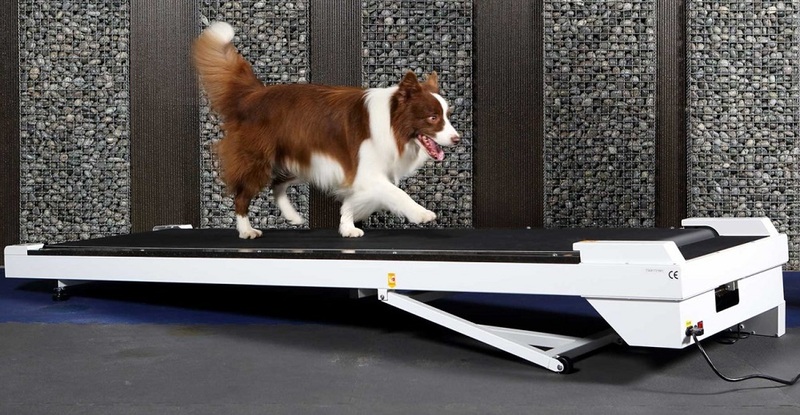 This treadmill is actually designed for the way dogs move and learn, plus the low-profile design encourages a natural gait for improved safety. The speed is adjustable up to 7mph and the onboard computer offers several pre-set workout options as well as a time and distance tracker. Plus, it is portable and it can be stored either on its side or on its nose, depending on the space you have for storage. If you’re looking for a dog treadmill for smaller dogs that doesn’t take up too much space, the PetZen DogTread for Small Dogs Up to 30 Pounds is a great option. This treadmill is specifically designed for dogs up to 30 pounds with a running area of 30”x14”. The treadmill itself weighs 47 pounds, so it is not impossible to move and it has a low-profile design which is comfortable and easy for your dog to use. This treadmill is actually designed for the way your dog moves and learns, so it allows for a natural gait and your dog will quickly learn how to use it. Plus, it has a programmable speed up to 5mph as well as pre-programed workouts with a distance and time tracker. If you have a small or medium breed, you don’t want to use a treadmill designed for large breeds because it will be too much space and your dog could be easily overwhelmed. The DogPACER MiniPacer Treadmill is an excellent option because it has a running area of 38”x16” which is ideal for medium dogs and smaller. This treadmill features an adjustable speed from 0.5 to 7.5mph with an adjustable incline as well. It is a highly affordable dog treadmill as well, plus you get the compact and sleek design which is also lightweight and foldable for easy storage. Plus, the onboard computer system comes with several pre-set programs and the ability to create your own custom programs. If you’re looking for a high-quality dog treadmill that works for dogs of almost any size (up to 180 pounds), look no further than the DogPACER LF 3.1 Dog Pacer Treadmill. This treadmill features a patented, lightweight compact design that folds up for easy storage and transportation. The design is sleek and practical in addition to being highly functional. It has an onboard computer system where you can use pre-set exercise programs or create your own according to your dog’s individual needs. Plus, it features a generous 71”x16.5” running surface as well as a quiet motor. Owning a dog is a big job. Not only is your dog your best friend and companion, but he is also your responsibility. It is your job to provide for his basic needs which includes a healthy diet, regular veterinary care, and basic training. It also involves making sure that your dog gets enough exercise. Exercise serves several purpose for dogs. Not only does it help him work off some of his excess energy, but it gives him some mental stimatulation as well. Exercise also helps your dog maintain a healthy body weight which is important because obesity increases his risk for other health problems. Exercise is not optional when it comes to dogs, but there will be days when taking your dog for a walk just isn’t going to happen. On those days, you’ll be glad you have a dog treadmill so your dog’s exercise needs can still be met. Keep reading to learn more about dog treadmills and to receive some tips for buying one and using one. Why Should You Buy a Treadmill for Your Dog? It is a great option for overweight dogs. If your dog is already overweight, he may not have the stamina to make it through a long walk outdoors. Having a dog treadmill enables you to give your dog some gentle exercise to help him lose weight and increase his stamina so he can eventually start walking outdoors, if that is your goal. It is perfect for people with limited time. After you work a long day and come home to take care of your family, taking your dog for a 30-minute walk may seem like more than you can handle. With a dog treadmill, you can make sure your dog’s exercise needs are met without adding another thing to your own to-do list. Plus, your dog can walk as long as he likes without any sacrifice of your own time. It works well for high-energy breeds. Some dogs have more energy than they know what to do with and even if you do take your dog for a walk, it might not be enough. For dogs who will take as much exercise as they can get, a dog treadmill might be a good option. Meeting your dog’s needs for exercise means that he will be healthier and less bored which means a lower risk for problem behaviors. It is a good option for unpredictable weather. On days when the weather just isn’t cooperating, you don’t have to feel bad about not being able to take your dog for a walk. Whether it is unbearably hot (or cold), raining, or snowing, you can make sure that your dog gets the exercise he needs without suffering for it. Now that you know what the benefits of a dog treadmill are, you may be thinking that your dog needs one! Before you go out and buy a dog treadmill, you should know the basics about how to use it properly. Keep reading to learn about common dog treadmill mistakes you should avoid. Skipping the warm-up. You can’t expect your dog to go from lying on the couch to running on the treadmill – make sure you give your dog time to warm up and cool down. Not challenging your dog. The more your dog exercises, the fitter he’ll become so you’ll need to adjust the intensity of his workout as he gains stamina. Unsafe form. Your dog will need to learn how to use the treadmill safely – make sure he is moving normally with a natural gait. Jumping off the treadmill. When your dog is done walking, make sure the treadmill is turned off before he gets off and make him step down instead of jumping. No variation. When your dog walks outside he’ll change pace and intensity, so make sure his treadmill walk involves some variation as well. Running on an incline. Adding an incline can increase the intensity of your dog’s workout but you should avoid having him run on an incline over 5% for more than 5 minutes. Now that you know what mistakes you might make with a dog treadmill, you’re ready to learn how to properly use it. Keep reading to receive some simple tips for using a dog treadmill. Get your dog used to being on the treadmill with it turned off before you try to teach him how to walk. Start off slow and gently work your way up to faster speeds, longer walks, and incline. Never tether your dog to the machine – you should be supervising all walks. Don’t position your treadmill so it faces a wall – your dog needs something to look at. Use plenty of treats during training to encourage your dog to like the machine. Teach your dog to sit when the treadmill stops so he learns to wait until you tell him to get off. Keep a close eye on your dog and stop the treadmill if he seems frightened at any point. Use the treadmill enough to meet your dog’s needs but make sure to walk outside as well. Now that you have a better understanding of why it is important to exercise your dog and how a treadmill can help, you’re ready to start shopping! If you’re still not sure where to start, try one of the best dog treadmills we’ve reviewed above. Best of luck!